Last month saw the premiere of the movie “Monuments Men” and with it the cultural importance of art history is placed center stage. While the characters endeavor to save the history of European art I noticed a touching reference to America’s art history. In one early scene the characters are discussing their mission while in the background the murals of one of America’s great painters acts as stage setting, as important to America as Michelangelo to Europe. 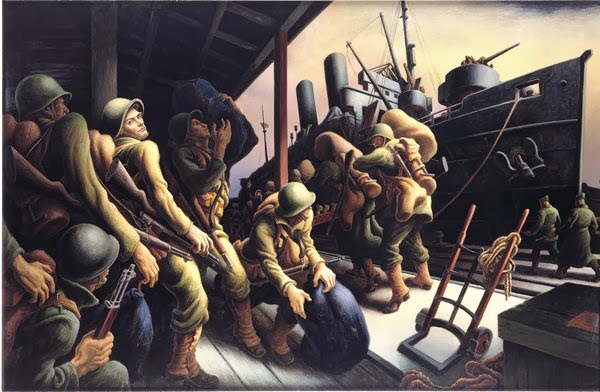 Thomas Hart Benton (1889-1975) was one of America’s foremost and most prolific painters in the first half of the twentieth century being the Grand Master of American Realism and the Regionalist Movement. During the depression of the 1930’s the Works Projects Administration (WPA) employed hundreds of painters decorating the many public building constructions going up all over the country. For me, growing up in New York, its was difficult not to be in a town or city that did not have a library, post office, bank or civic building without a WPA mural in it. Where in Europe there was a history of Church patronage, in the US private companies and public buildings hired artists to decorate their lobbies. Amongst the thousands of murals, Benton's are perhaps the most stunning. Born in Missouri in 1889 Benton studied at the Art Institute of Chicago and then in Paris returning to New York in the 1920’s a self described “Enemy of Modernism”. The bigness of Bentons’s work was as big the young industrial midwestern boyhood he grew up in, and as big as the country he loved. Benton developed a socialist bent for the working class American having spent time with well known artists like Diego Rivera and others. 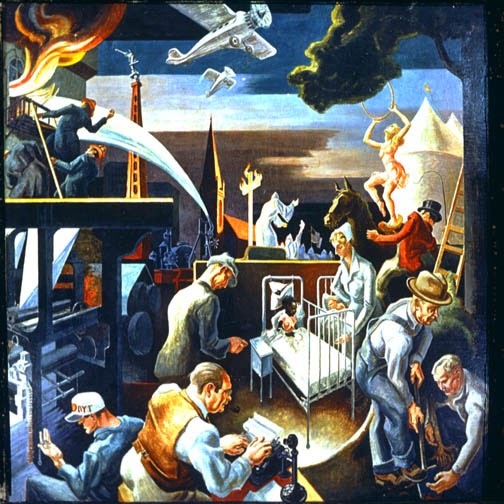 Benton would go on to make many murals in his career before his death in 1975. After WWII his representational style fell into disfavor allowing him to be eclipsed by his own students like Jackson Pollock. Today archivists and curators (Monuments Men in their own time) are trying to save these American masterpieces, so that this cultural time in our history is not forgotten. 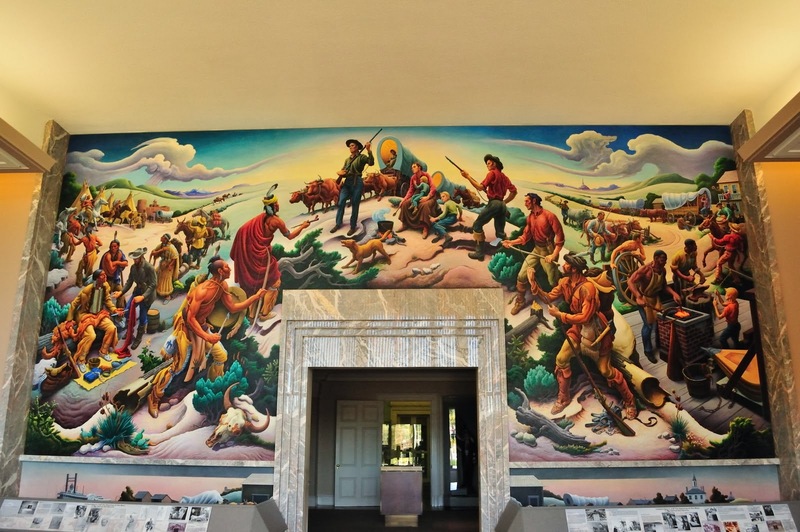 Here are a few examples of Benton's Murals. These murals made Benton infamous, for their stark depiction of rustic Americans, as well as the inclusion of American racism in the form of a Klan Rally. This image was painted for the US War Department as a propaganda image. Needless to say the painting was rejected.